2.4L compact size: 200mm(L) x 200mm(W) x 60mm(H). Under 90W low power consumption with MoDT technology. 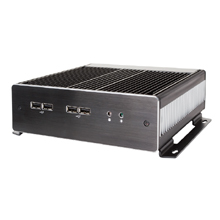 Fanless design robust thermal solution. Supports Intel® Core™ 2 Duo P8000, P9000 series TDP 25W dual core CPU with 667/800/1066MHz FSB. Intel® GM45+ICH9M chipset with GMA X4500MHD graphics engine, supports Microsoft® DirectX™ 10. Robust, rugged mechanical design with anti-shock and anti-vibration properties. Wide power range support from DC 12V~20V Input in most of industrial environments. Supports Watch Dog Timer function. Supports HDMI interface with HDCP protocol for high definition content output. Supports dual display through HDMI and DVI connectors. Full HD 1080p video playback ability. Supports SATA 2.0 2.5” internal hard disk drive. Provided eight USB 2.0 ports for easy connect to most peripherals. Two mini Card slots for function extension.